The Carro Armato L3 Contro Carro (shortened to L3/33 CC) is a Rank I Italian tank destroyer with a battle rating of 1.0 (AB/RB/SB). It was introduced in Update 1.85 "Supersonic". 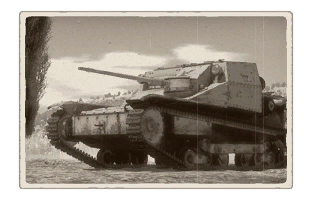 The L3/33 CC is an Italian tank that is the Warthunder Equivalent of a Shoebox on tracks with a gun. This vehicle has very little armour which allows for it to quickly and deftly maneuver the battlefield, scouting for pockets to position the vehicle for tactical advantages against the slower and heavier enemy vehicles at a close range. Write about the mobility of the ground vehicle. Estimate the specific power and manoeuvrability as well as the maximum speed forward and backwards. The L3/33 CC is best used in ambushes, as this tactic allows it to strike from close distance; an hill can provide a nice spot for this, as the L3 has 15 degrees of gun depression and can get to cover by simply reversing if it is spotted in time. Skins and camouflages for the L3/33 CC from live.warthunder.com.